War memorials play an important role in commemorating Australia’s involvement in the First World War and in demonstrating the pattern of Queensland’s military history. Queenslanders and tourists can now visit some of the many war memorials scattered throughout our state using specially-developed driving itineraries. The memorial journeys are currently unavailable. 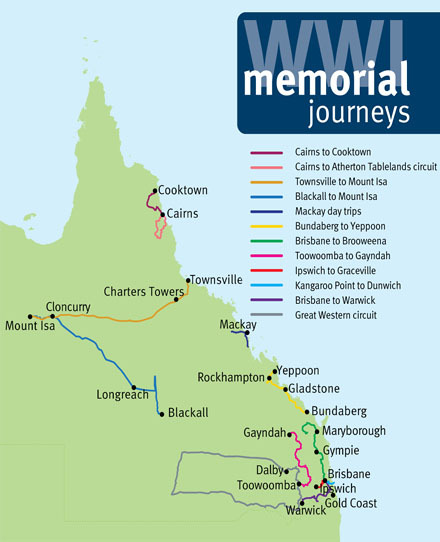 The driving journeys feature 90 war memorials, many of which are on the Queensland Heritage Register, from the south-east corner out to Mt Isa and up to Cooktown. This project was part of the Queensland Government’s contribution to commemorate the 2015 ANZAC Centenary.